From Tinian, Boeing B-29 Superfortress bombers and crews of the 509th Composite Group flew atomic bombs, observers, and instruments to their targets in Japan. This Aug. 2, 1945, Tinian cover from T/Sgt. Richard J. Lewinson at APO 247 was posted four days before the flight group’s Enola Gay bomber — accompanied by planes Great Artiste, Necessary Evil, Full House, Jabit III, Straight Flush, and Big Stink — departed on their fateful mission over Hiroshima, and one week before Bockscar bombed Nagasaki while observers and instruments flew along aboard Great Artiste, Big Stink, Enola Gay, Laggin’ Dragon, and Full House. The orange 6¢ Monoplane airmail stamped envelope, Scott UC5, paid the concessionary rate for a half-ounce airmail letter to or from an active-duty member of the armed forces overseas. Lewinson died in 1995. In this Aug. 9, 1945, letter to Pvt. Richard M. Klosse, his father wrote: “I heard on Radio just now they drop one of the new bomb on Nackasacko I wonder the Japs like that, and this afternoon Russia declared War on Japs, so that will make short work of them now. I hope they keep it up so you can get home sooner.” The misspelling of Nagasaki was a reasonable guess for a place the writer had probably not yet read in print. A news clipping enclosed with the letter reported Marine Gen. Holland M. Smith’s July 28 prediction that Japan would surrender or be defeated within six months. The cover went first to APO 423 at Karlsruhe, Germany. From there it was forwarded to APO 743 at Vitry sur Seine, France, and finally sent for a directory search on Sept. 5. It was struck with a boxed “RETURNING TO THE UNITED STATES” marking and forwarded to Klosse’s home address at Tonawanda, N.Y. A carmine 6¢ Twin-engine Transport airmail stamp (Scott C25) paid the concessionary rate. Richard Klosse died in 2006. These Japanese military postal cards, mailed May 30 and July 3, 1945, were sent by a soldier who was conscripted at Hiroshima six months before an atomic bomb destroyed that city. Both were examined and passed by military censors. The first card was posted at Hiroshima, the recruitment and command center; the second, after the soldier’s unit had been deployed to Kochi. Both are addressed to the sender’s family in Hiroshima prefecture. Former president Harry S. Truman sent this July 20, 1962, airmail cover to Maj. Gen. Harry H. Vaughan, who had been Truman’s military advisor. Vaughan had accompanied the president to Potsdam, Germany, in July 1945, when Truman made the fateful decision to drop the atomic bombs on Japanese cities. Postage was free for franked mail sent by a former president. The year date on this June 14 cover sent by USS Indianapolis steward Felix Heluz Sarne is indistinct, but it was probably 1945. (That was when addressee Cmdr. George Dyer was assigned to Navy headquarters duty at Washington.) At that time, Indianapolis was being repaired at Mare Island, Calif., before transporting atomic bomb components to Tinian. Sarne had served aboard Indianapolis from 1939 to 1944, yet his Navy rank does not appear on the envelope, and the bright green 20¢ Twin-engine Transport airmail stamp (Scott C29) appears to have paid the civilian single letter airmail rate from Hawaii to the United States. Perhaps Sarne was on his way home to the Philippines when he posted this letter. He was not on board Indianapolis when a Japanese submarine sank her on July 30, 1945, after she had delivered the bomb material to Tinian. Sarne died in 1986. Second Lt. Lewis N. Chittock mailed this Sept. 2, 1944, cover at Albuquerque, N.M., while preparing to monitor fallout from the planned July 1945 Trinity atomic bomb test at Alamogordo. Surface postage was free for a member of the armed forces on active duty. The Air Weather Service cartoon mascot reproduced on the envelope is one of more than 1,200 military unit insignia created by Walt Disney studio artists during World War II. Chittock retired as an Air Force colonel in 1965; he died in 2011 at age 92. Ken Lawrence purchased this splendid cover at an eBay auction sale in September 2016, but unfortunately he never received it. Evidently it was lost in the mail and probably no longer exists. Glenn T. Seaborg, addressee of this cover, was co-discoverer of plutonium and other trans-uranium elements. From 1942 to 1946, he directed plutonium research at the Manhattan District’s Metallurgical Laboratory at the University of Chicago. The downtown Chicago P.O. Box 5207 mail drop kept the MetLab location secret, but later became the public address of Argonne National Laboratory in the Palos Hills forest outside the city. The sender “Sgt. A. C. Turner” was actually O. Pollaschek, a European Jew who had served in the elite inter-allied Ten Commando unit. After the war, Ten Commando veterans tracked war criminals, translated captured documents, and conducted interrogations. Pollaschek’s “37 D.C.U.” address at British Army of the Rhine headquarters in Germany probably identified a Document Control Unit. The Trinity site for the first atomic bomb test occupied an 18-mile-by-24-mile tract of the northwest corner of the Army Air Base at Alamogordo, N.M. This April 29, 1945, cover was posted eight days before the May 7 rehearsal blast, when 100 tons of conventional explosives were detonated at the site. The fireball was visible at the airfield 60 miles away. This July 4, 1942, cover from Fribourg, Switzerland, to Manhattan Project physicist Gerhard Dessauer at the University of Rochester was inspected July 6 by Swiss customs at Basel, then routed through Vichy France (which avoided German censorship) and Spain to Lisbon, Portugal. It was opened and examined by British Imperial Censorship at Bermuda en route to the United States. An ultramarine 30-centime Jungfrau airmail stamp (Switzerland Scott C27) paid single letter surface postage to a foreign destination and a plum 70c Ticino stamp (C31) paid the airmail surcharge for a 5-gram letter to North America. This May 26, 1944, British military air letter from Gibraltar was forwarded June 28 from Toronto, Ontario, Canada, to Bishop’s Lodge at Santa Fe, N.M., a posh ranch and spa that provided accommodations for Los Alamos Scientific Laboratory guests. The chief engineer of Caterpillar Tractor Co. at Peoria, Ill., sent this April 7, 1944, letter to Pfc. Robert J. Vogel, a former company engineer who had enlisted in the Army and had been assigned to the 1552nd Army Specialized Training Unit. Upon graduation, Vogel had been transferred to the Special Engineer Detachment of the Manhattan Project, serving as a test engineer at Oak Ridge. To avoid disclosing the secret location in Tennessee, university mail was forwarded to P.O. Box 92, Station J, an undercover address in New York City. This March 27, 1944, cover, with the 9¢ triple domestic letter rate paid by metered postage, recently appeared as an eBay Internet auction offering. From this we have learned that the postal address for Hanford Engineer Works was P.O. Box 429, Pasco, Wash. Industrial engineer Charles A. Weckler (correct spelling) worked for Du Pont at the Hanford B and D plutonium production reactors in the 26-square-mile 100 Area along the Columbia River. With this fourth installment we continue my series of Spotlight columns on this subject. Part 1 appeared online on Sept. 1, 2016; part 2 on Sept. 28, 2016; and part 3 on Dec. 26, 2016. Besides the three secret atomic cities at Hanford, Wash., Oak Ridge, Tenn., and Los Alamos, N.M., subjects of last month’s installment of this Linn’s Spotlight series, several universities hosted secret atomic bomb-related research, development, and analysis programs. The department of radiology at the University of Rochester became the Army’s contractor for classified studies on the medical aspects of radiation. Shown nearby is a July 4, 1942, cover from Fribourg, Switzerland, addressed to Gerhard Dessauer, a German emigre physicist who had earned his doctoral degree at Rochester for research on proton-induced fission. Dessauer studied the biological effects of radiation for the Manhattan Project. In 1946, he supervised radiation monitoring at the postwar Bikini Atoll atomic bomb tests. Swiss postal history expert Charles LaBlonde called my attention to the Swiss Customs July 6 datestamp and cachet struck at Basel. Letter mail is not ordinarily subject to customs inspection. Although the letter was sent by one of Dessauer’s relatives, the “Department of Physics” line in the address might have piqued official interest, but there might have been a more sinister reason for the diversion. A tantalizing though unlikely possible tie-in cropped up in Allied surveillance transcripts of captured German atomic scientists. As Allied armies advanced across France and the Low Countries into Nazi Germany in April 1945, a secret American Army team of intelligence agents and scientific advisors, code-named the Alsos Mission, roamed the forward areas in search of German nuclear physicists, their laboratories, and records of their program. From February 1942 until they were captured by Alsos men, German scientists had attempted to build a nuclear reactor with military potential, but had failed. To evaluate the extent of the Germans’ progress toward building an atomic bomb, the leading physicists were held incommunicado at Farm Hall, a secret location near Cambridge, England. During their Farm Hall internment, code-named Operation Epsilon, British intelligence officials surreptitiously recorded their conversations and sent transcripts to the Manhattan Project. English-language transcripts have been published in the 1996 book Hitler’s Uranium Club: the Secret Recordings at Farm Hall by Jeremy Bernstein. HEISENBERG: In that respect one should never mention names even if one knew of a German who had anything to do with it. GERLACH: For instance, I never mentioned the name of that man Albers (?). The “Secret Service” people kept asking me: “From whom did you get information?” and I always replied: “There was an official in Speer’s ministry and in the Air Ministry who gave it out officially. I did not say it was Albers (?) who did it. HEISENBERG: I had a special man who sent me information from Switzerland. That was some special office. Of course I have burnt all the correspondence and I have forgotten his name. LaBlonde’s observation about the unusual Swiss customs examination of my cover to Dessauer, the Manhattan District physicist, had reminded me of Heisenberg’s cryptic remark that has never been further explained. In September 1944, the U.S. Army selected the Alamogordo bombing and Gunnery Range near Socorro, N.M., about 200 miles south of Los Alamos, for the world’s first atomic bomb test, dubbed Trinity by director J. Robert Oppenheimer. The next task was for scientists to devise methods to study the effects of the explosion, including the intensity of radiation dispersed downwind. As a charter member of the U.S. Army Air Forces’ Air Weather Service in 1937, Lewis N. Chittock pioneered studies of ionizing radiation dispersed by prevailing winds. The Army sent 2nd Lt. Chittock to Albuquerque to supervise the Trinity test measurements. Pictured nearby is a Sept. 2, 1944, cover he mailed upon arrival there. 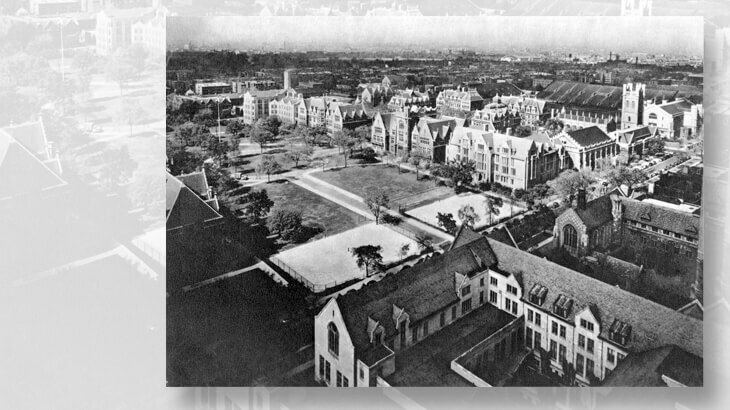 Construction of the necessary facilities began in November 1944. P.O. Box 632, Socorro, N.M., was the secret address for the soldiers engaged in building and security at the Trinity site. To date, I have not seen a cover to or from that mail drop. If a Linn’s reader has one, please share it with me. That was the same day that Gen. Dwight D. Eisenhower wrote from his European headquarters to his superiors in Washington, “The mission of this Allied force was fulfilled at 0241, local time, May 7th, 1945.” The bomb would not be needed to defeat Nazi Germany. But the Pacific War was still being fiercely fought, so participants in the top-secret nuclear program did not pause to celebrate. Fallout from the Trinity test was discovered 200 miles away from ground zero, and in scattered so-called hot spots as far away as Indiana, but a full report on the toxic effects of that radiation was kept secret for more than 50 years afterward. Among the New Mexico locations within the fallout plume were Albuquerque, Roswell, Las Vegas, and Santa Fe, according to a Sept. 15, 2014, Wall Street Journal article. The 1984 book The Day the Sun Rose Twice: The Story of the Trinity Site Nuclear Explosion July 16, 1945 by Ferenc Morton Szasz reported that another test of fallout dispersal consisted of mailing 142 registered letters and 90 unregistered letters from Los Alamos to fictitious addressees in towns throughout the state, each containing a radiation-sensitive film badge, to be developed and measured upon their return to the laboratory as undeliverable. One sent to Bingham, about 70 miles northwest of ground zero, measured 8.2 roentgens of exposure (not believed to be dangerous in a single exposure, but more than 20 times the average amount a person gets from natural sources in a year), the highest level recorded by that method. On July 16, 1945, just hours after the successful Trinity Test explosion at Alamogordo, the Navy cruiser USS Indianapolis departed Hunters Point Naval Shipyard at San Francisco with a secret cargo — the principal components of the Little Boy atomic bomb, including about half of the world’s supply of enriched uranium. She arrived at Pearl Harbor three days later. On July 26, she delivered the device at Tinian Atoll in the Northern Mariana Islands. Two Los Alamos security officers brought the remaining components and fission material aboard Douglas C-54 Skymaster transport airplanes, which arrived on July 28 and July 29. The 509th Composite Group of Boeing B-29 Superfortress bombers, specially modified to carry atomic bombs, and their flight and support crews, had transferred from stateside training bases to Tinian a month earlier. The illustrated cover from an Indianapolis steward to Navy Department headquarters was probably mailed about a month before she departed on her secret mission to Tinian. A member of the 509th Composite Group mailed the next illustrated cover, from Army Post Office 247 San Francisco, the Tinian APO, just four days before the Enola Gay dropped the uranium bomb on Hiroshima on Aug. 6, 1945. Two Japanese military postal cards in my collection represent that buildup, both sent by a member of Aki Troop (205th Division of the 2nd Army), which was formed April 2, 1945, at Hiroshima. In June, Aki Troop was deployed to Kochi, where it remained until the Japanese surrender, and thus that unit escaped destruction by the atomic bomb. The first card was mailed May 30, 1945 (Showa year 20), at Hiroshima; the second, July 3 at Kochi, both to the sender’s family in Hiroshima prefecture. My collection includes the Aug. 6 (Hiroshima day) letter from a Navy man in Florida to his girlfriend at home in Maine, that expressed concern about the fearsome potential of atomic bombs after acknowledging that it probably would bring the war to a swift end. An interesting cover in my collection, illustrated nearby, includes the original letter and newspaper clippings that a father sent to his son, Pvt. Richard M. Klosse, in the Army in Germany. 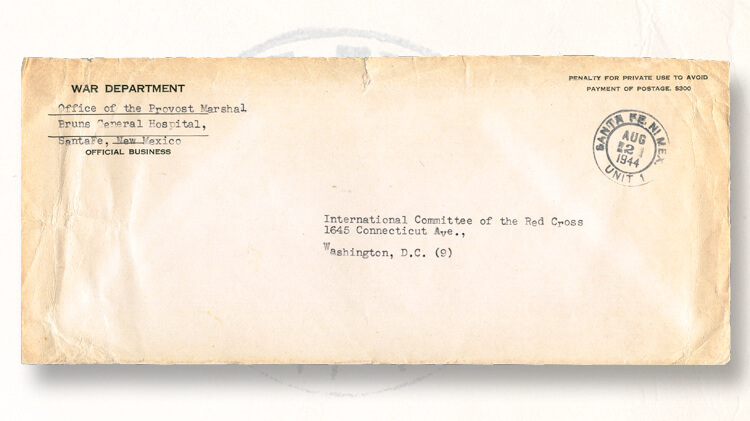 Aug. 9, 1945, the date of the letter and the postmark, was the day that an American atomic bomb devastated Nagasaki, which Klosse’s father had not learned to spell correctly. This is a poignant artifact of World War II that helped me understand the events as ordinary Americans experienced them. Klosse had enlisted in the Army in November 1944 at age 18. He was assigned to the freshly organized 423rd Regiment of the 106th Infantry Division, and immediately shipped out to Europe. He arrived there just in time to experience combat in the Battle of the Bulge, Nazi Germany’s desperate attack in the Ardennes forest of Belgium and Luxembourg, one of the bloodiest campaigns of the war. His unit was encircled for a time at St. Vith in a blinding snowstorm, until clear weather brought air support that broke the German offensive. After Germany surrendered, the 423rd performed occupation duties at Karlsruhe, the location of APO 423 to which this cover was sent. Klosse’s father wrote that he hoped the atomic bombs and Russian declaration of war on Japan would hasten the end of the war and bring his son home, which is exactly what happened. How postal history tells the story of the atomic bomb: The history of the atomic bomb began with Albert Einstein’s Aug. 2, 1939, letter to President Franklin D. Roosevelt. The covers and letters that document atomic bomb’s design, assembly and testing: Undercover P.O. boxes, eyewitness accounts of bomb tests, and an Enola Gay gunner's letter home are all part of the amazing story. What newly surfaced atomic bomb postal history teaches us: New information about the history and the postal history of the Manhattan Project and the atomic bomb have come to light. The letter followed the younger Klosse from APO 423 at Karlsruhe to APO 743 in France. Failing to catch him there, directory service stamped the envelope “RETURNING TO UNITED STATES” and sent it back to his home at Tonawanda, N.Y.
About 5,800 miles to the east of Karlsruhe, Chicago Daily News reporter George Weller entered Nagasaki on Sept. 6, 1945, four days after Japanese officials signed the instrument of surrender on the deck of the USS Missouri at Tokyo Bay, but his eyewitness dispatches were censored by Gen. Douglas MacArthur’s staff and never reached his paper. Fortunately for history’s sake, Weller’s son Anthony found long-lost carbon copies of those reports after his father died in 2002, and published them in the 2006 book First into Nagasaki. We arrived at Nagasaki, Japan, last Saturday aft. & we pulled out of there this a.m. for Okinawa again. We picked up about 500 [American] POWs at Nagasaki & will no doubt unload them at Okinawa … Yesterday we got to go all over Nagasaki or what is left of it. It use to be a town of about 250,000 pop. The place is flattened out by the atomic bomb. We are one of the first groups to see this town. Honey you can’t imagine how one of those bombs effects things. Big steel plants larger than any in our section but about the size of the steel mills in Pittsburgh & Weirton they were just completely obliterated. You should see the faces on the homeless Japs they are still stunned. Little children bandaged up & on crutches, no homes in this one area. All you can see is nuns & smell dead bodies. I can’t give you a good description but will tell you more & all about it when I get home. The U.S. Joint Chiefs of Staff and the U.S.-U.K. Combined Chiefs of Staff were never asked their opinions about whether or how to use atomic bombs. The president’s advisors ordered the Army to select targets in Japan and destroy them. Gen. Carl “Tooey” Spaatz, commander of the U.S. Army Strategic Air Force, defied the decision to drop the atomic bombs. He refused to go forward with them until he received written orders to do so. He was merely the first to challenge or to rue the decision to bomb Hiroshima and Nagasaki. In fact, most senior American military commanders expressed reservations. Gen. Douglas MacArthur, Army Chief of Staff Gen. George C. Marshall, U.S. Army Air Forces commander Gen. Henry H. “Hap” Arnold, Gen. Claire Chennault, Gen. Curtiss E. LeMay, Navy Secretary Ernest J. King, Navy Chief of Staff Adm. William D. Leahy, Chief of the Pacific Fleet Adm. Chester W. Nimitz, Adm. William F. Halsey Jr., and Gen. Dwight D. Eisenhower believed that using the atomic bomb was neither necessary to win the war nor sound military policy. Nevertheless, President Harry S. Truman’s unrepentant decision was popular with veterans and with the general public. He went on to win re-election in 1948, in the greatest political upset in presidential history. Unlike his top generals and admirals, he never regretted using the bombs, which he believed had saved half a million lives on both sides. I think a (printed) signature-franked Truman cover is an appropriate addition to a collection of atomic bomb postal history. Mine is a July 20, 1962, airmail cover to Maj. Gen. Harry H. Vaughan, Truman’s military advisor who had accompanied the president to Potsdam, Germany, in July 1945, where Truman made the fateful decision to drop the atomic bombs on Japanese cities. On January 3, 1946, the captive German nuclear physicists were returned to the headquarters of the British Army of the Rhine (B.A.O.R.) at Bad Oeynhausen in the British occupation zone of Germany. There they were confined for another month at the nearby village of Alswede while their activities continued to be monitored. My final cover shown here, mailed from B.A.O.R. headquarters shortly after they were returned to their homeland, definitely has a connection to the American atomic bomb, and has intrigingly suggestive links to the men who tried but failed to build an atomic bomb for Nazi Germany. Without access to the contents I have no proof, but the lives of the sender and the recipient offer evidence that this was not an insignificant letter. The sender, Sgt. Andrew C. Turner, was actually O. Pollaschek (1919-2011), a Jew from Czechoslovakia whom the Nazis had imprisoned at the Buchenwald and Dachau concentration camps in 1938. He was released only because the British Labour Party arranged for him to enter England as a refugee, arriving in August 1939, just before the war began. During the war, Turner had served in the secret inter-allied Ten Commando unit, the most highly skilled special force in the British Army, whose members conducted some of the most daring and hazardous missions of World War II. He had been a member of the commando’s X Troop, 88 exiles from Germany and Nazi-occupied countries in Europe, nearly all of them Jewish, whose members spoke perfect German. According to British Prime Minister Winston Churchill, the troop was designated X, the mathematical symbol for an unknown number, “because they will be unknown warriors.” Later in the war, X Troop became Troop 3. X Troop members became experts in clandestine operations. They specialized in parachuting, piloting small boats, climbing cliffs, and effective use of explosives and all types of German weapons. Some learned to pick locks and drive trains. For their protection in case they were captured, members of X Troop were given English-sounding cover identities. More than half became casualties — 21 killed in battle or executed after capture, 22 wounded. The ones who survived the war kept their noms de guerre and became British citizens under those names. In Italy and France, members of X Troop were dispersed among other units as interrogators, interpreters, captured document analysts, and for occasional infiltration, snatching prisoners, and rescue operations behind enemy lines. One officer and 41 men of lower ranks landed on the beaches of Normandy on D-Day, most of them on bicycles. Following the German surrender, they tracked down and arrested Gestapo and SS members, heads of war industries, and war criminals, feigning sympathy with Nazism as an effective ruse to round up whole networks of fugitives. After their unit disbanded in September 1945, Ten Commando veterans tracked war criminals, translated captured documents, and conducted interrogations. Pollaschek’s B.A.O.R. headquarters “37 D.C.U.” address on the envelope flap probably identified a Document Control Unit. The addressee on the cover, Glenn T. Seaborg (1912-1999), shared the 1951 Nobel Prize in chemistry. He was co-discoverer of plutonium and other trans-uranium elements. From 1942 to 1946, he directed plutonium research at the Manhattan District’s Metallurgical Laboratory at the University of Chicago. In my September 2016 article, I opined that only the arts can convey the panorama of World War II with appropriate drama, nuance, and reverence. One epic-worthy irony is that the Nazis, having declared themselves the vanguard of an intellectually and culturally superior Aryan “master race,” failed to create a nuclear fission reactor or weapon, but not because they didn’t try. In other respects, some of Germany’s secret weapons were more advanced than those of the Allies, such as remotely guided missiles and ballistic missiles, but British and American scientists countered those with radar, radio jamming, and by bombing and staging commando raids against the factories that manufactured them. The Axis powers failed to develop comparable measures that could have defended against atomic bombs. For these reasons, the outcome of the war seems in retrospect to have been foreordained. In 1944 and 1945, however, the multinational team of Manhattan Project scientists and engineers believed they were involved in a desperate race to beat the Nazis. Having won the race against Heisenberg’s group, members of the Allied team stood in awe of their success, but many of them were beset by qualms about what they had wrought. Those qualms resurface from time to time, as they did two decades ago when the U.S. Postal Service announced plans to issue a stamp that commemorated the Hiroshima bomb, then withdrew it, and when the Smithsonian Institution scrapped its planned atomic bomb exhibit. Postal history artifacts help us all to explore the events more deeply than most popular history books are able to do. Most of the examples shown here provide glimpses of the lives of individuals whose stories are not told in those books. Their dedication, persistence, and sacrifice merit our appreciation and gratitude — regardless of how the recurrent controversy plays out. Conflict, controversy, loyalty, treachery, irony, suffering, pride, vanity, glory, victory, and defeat are essential ingredients of drama. Stage and screen performances of such clashes have been the most effective media by which most people, from antiquity to modern times, have learned about momentous historical events. Eventually they must retell the atomic bomb story as both triumph and tragedy. Until then, carefully selected nuggets of postal history can serve both as flashbacks and as previews of the pageant yet to be completed. This is a rich and complex subject, which has benefited from a collective spirit. Each of the collectors who contributed one or more reports — Alan U. Hershey, Paul Filipkowski, Les Winick, Richard W. Helbock, Wayne L. Youngblood, John M. Hotchner, Larry Nelson, and Joseph G. Bock — has provided information and analysis not previously available to hobbyists. It has been my privilege to join this multigenerational research effort. For now, this concludes my report on recent research and discoveries related to atomic bomb postal history. Who will write the next chapter?